Summary: If you liked The Lord of the Rings, you’ll like this. This expansion on the source material is typical of Jackson, and sometimes, as in this prologue, it is effective. The decision to make three films from this slightest of novels was criticised by Tolkien fans, and as it is the film does take time to get going, especially during the interminable ‘party’ where we are introduced to the many, mildly annoying, yet worrying indistinguishable, Dwarves. 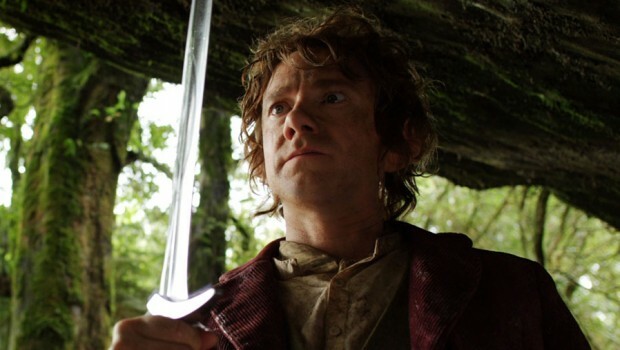 The Hobbit has a very different sensibility to the Lord of the Rings – it’s a more innocent time – and this would be fine except that this encourages Jackson to indulge some of his more annoying tastes. At the best of times he can be a juvenile director, and belching Dwarves are not what The Hobbit should be about. Thankfully the need to retrofit the world of The Hobbit to that of the Lord of the Rings means that we are spared the sight of Elves tra-la-la-lallying, and once Thorin and Company set out from Hobbiton the action rarely stops; indeed the Dwarves fall into so many scrapes, traps, pits, and hazards that they seem almost invincible, though we do pause for a rather dull meeting of the White Council (Blanchett, Weaving, Lee) in Rivendell. We are also introduced to another wizard, Radegast (McCoy), who runs a sort of Mrs Tiggywinkles in Mirkwood, and has his suspicions as to who is behind the worrying signs of emerging darkness in Middle-earth. Quibbles aside, the triumph of the film is the return of Gollum and the staging of the iconic chapter “riddles in the dark’. Freeman, who plays Bilbo straight throughout, is marvelous here against Serkis’ Gollum, as pitiful and despicable as ever. The other breakthrough performance is Armitage as the prickly, proud and vengeful Thorin. (Hubris… just sayin’.) And Howard Shore’s score is sublime, mixing familiar themes from The Lord of the Rings with a new Hobbit score, underwriting the emotional return to a familiar and beloved world. But in terms of the direction, the only innovation that Jackson makes is in relation to frame rate and technology; famously audiences are complaining of feeling sick watching the HFR 3D presentation. I’m not sure who these weak stomached audiences are; I didn’t feel in the least queasy, but was struck by how fake the HD looked, especially when live action sequences were mixed with CG. The long and the short of it; if you liked The Lord of the Rings, you’ll like this. Welcome back.